If you’re a publisher seeking a new how-to title, or a company with a product used in creative expression, you’ve come to the right person. I am flexible, ready to devote my talents, skills, and enthusiastic energy to working for you. I am a team player who can follow your lead, contribute different perspectives, join your think-tank, or help build consensus. I am resourceful, focused, and efficient to save you time and money. And, if you scroll down, you’ll see how versatile I am. No job in the needlework and crafts field is too hard, too big, or too small. I’m an upbeat wordsmith with an English teacher’s credentials. I've got decades of writing experience for the top publishers, but I can bring a modern, friendly chat style to blurb, blog, or book. Visuals with immediate appeal strike an emotional chord. Good taste, whether elegant, whimsical, or funky rules. Text has got to be concise--no one likes wading through a lot of verbiage! On any project, I take full responsibility for clear, reliable descriptions and directions. In fact, the step-by-step instructions I’ve written over the past three and a half decades rates better than 99.9 percent pure accuracy. As an editor, author, and book packager looking at all kinds of outlets and media, I know what's kinda now, kinda wow, and I watch for trends on the horizon. Producing also means team-building: finding, hiring, cultivating, and contracting people with creative talent and experience. Since 1979 I have been at the helm of many publications -- special interest magazines and books. 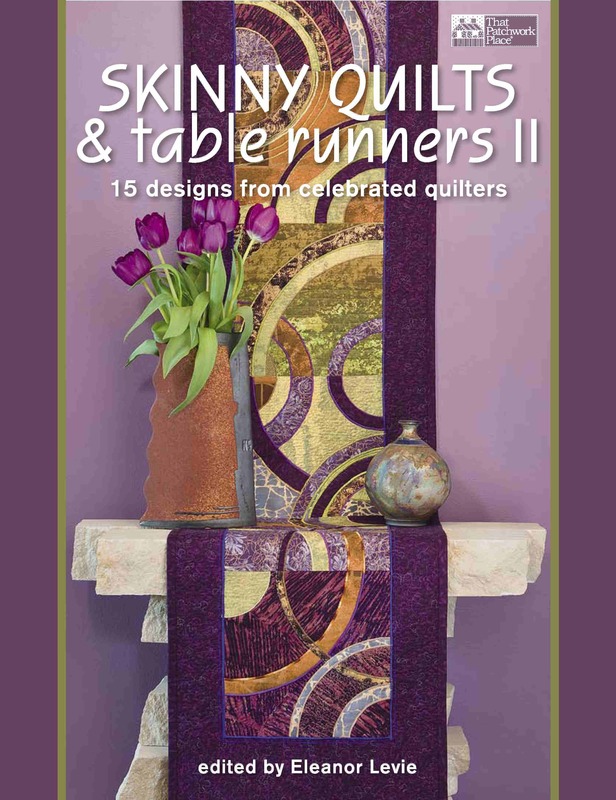 In 1998, as Rodale Press was closing down their quilting department, I won the bid to complete the Rodale’s Successful Quilting Library series. Within the next 4 years, I produced 8 volumes, each with 128 pages and 150 to 300 original photos. I created a budget and hired a team—including an art director, photographer, editors, writers, designers, sample makers, illustrators, hand models, and more. I contracted them, worked with them closely, served as “banker,” and kept within the budget. I’m very proud of the results—which certainly live up to the Successful part of the series name. 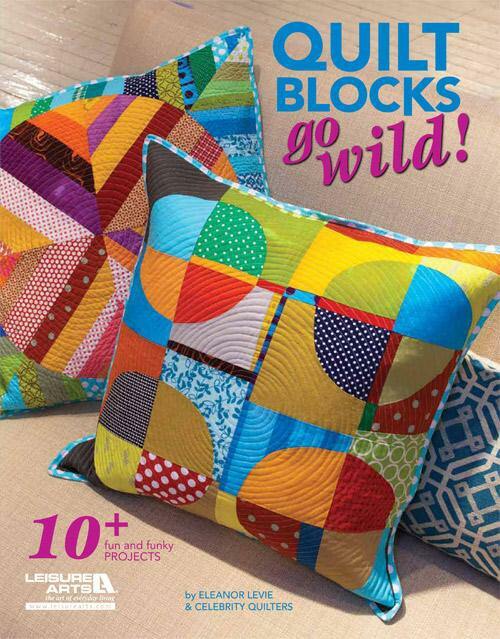 I authored and produced Creations in Miniature: 101 tiny treasures to stitch and craft, published by Krause, and Quilt Blocks Go Wild!, published by Leisure Arts. To learn more about my books, visit my books page. I guided Linda Johansen on her ﬁrst book, and worked with C&T Publishing, Inc. on a pilot for the Fast, Fun & Easy series. The result? Fast, Fun & Easy Fabric Bowls was the runaway top selling quilting book of 2004. I can gently guide a new author through the process from planning to proofing, or any phase of the process. Even experienced authors are frequently less than conﬁdent about writing, organizing, or preparing for photography. I can help: from hand-holding, to shaping a manuscript, from kicking it up a notch to a complete rescue mission, I'm here for you. If you’re a creative soul interested in doing a book, either to pitch to a publisher or self-publish, give me a holler. I’m happy to consult on marketability, and how and where to pitch the book. I’ve worked on just about every kind of how-to there is. A glance at my bibliography will point up a strong background in quiltmaking. But I'm a Jackie of all trades, confident in covering crafts as diverse as decorative painting, basketmaking, weaving, refinishing furniture, floral arranging, wearable art, and d-i-y home dec. In a pinch, I can write directions working only from a photo. I’ll format my style to suit your needs. In preparing for any illustrations, I’ll always provide clear pencil sketches for diagrams and patterns suitable to the book specs. I can recommend or hire illustrators at your request. 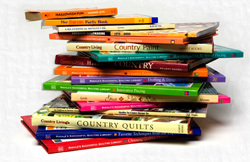 Cheerio, bonjour, and g’day, mate: I have also Americanized many craft and quilting books from the UK, Canada, Australia, and France. I’m quite willing to travel to you, but in this day and age, there’s little I can’t do from my ofﬁce at home. Via telephone, I can interface with one person or teleconference with the whole team, day or evening. With email, I can get you the proposals, manuscript, or updates you need in time-warp speed. Or send you scans and digital images that will show you swatches, sketches, and samples. I can also ﬂy jpegs of professional photography over the Internet to you in time for you to request photostyling changes. Have an author in my neck of the woods? That begins with the Greater Philadelphia area, and stretches north and south to the New York--DC corridor, east to New Jersey and west to Lancaster. All are easy day trip for me. 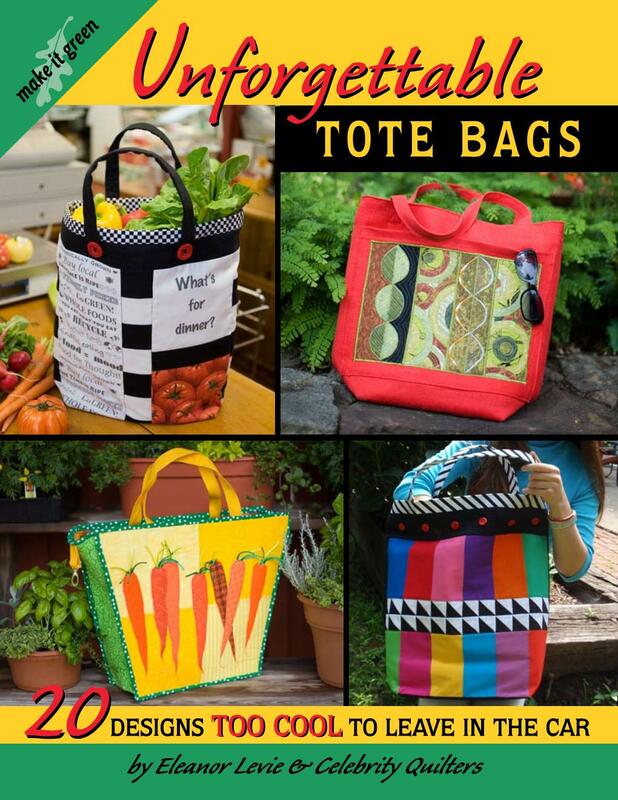 Desperately (or not) seeking new designs or designers? Let me scout for you! I cover lots of shows. I'm involved in lots of networks. And I'm always on the lookout for new masterpieces and the talent behind them. Have a special magazine issue or theme coming up? Looking for something fresh and different? Let me know! I’ve written articles for U.S. News & World Report, Yarn Market News, Mark Lipinski's Quilter's Home. Check out my quilting blog. Yes, I'm grateful for bylines or credits, but I'm sensitive to editorial crises that require anonymity. Something comes in and it’s a disaster. We’ve all been there. Don’t kill it; I’ll save it, and make sure you save face, too. You don’t have to worry about my ego! Jazz up intros, captions and subheads. Make copy kickier and more inviting. I will follow your lead and your style, guarantee consistency, good ﬂow, and clarity. I’ll work to get you gorgeous photographic images. That means pre-photography meetings or discussions with jpegs to ensure we capture the mood you want. It means working with a great photographer-your choice or I can make recommendations. Photo editing means on-site care so the viewer understands exactly what the project is. Photo styling means prepping and propping, so the viewer appreciates what the project offers…and how great the end product will be. From warm and welcoming location shots, to clean and crisp gallery shots, you’ll get the best. And since this isn’t New York City, the prices will be unbeatable. 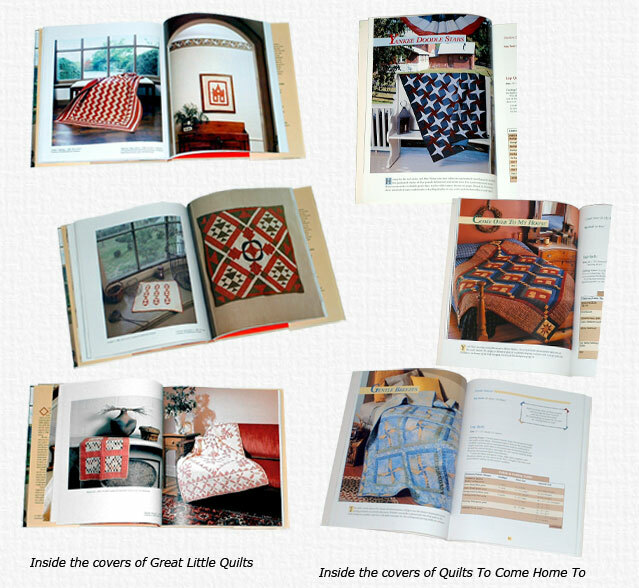 As examples of my photo styling, take a peek at the pages on the left--Great Little Quilts, which I authored, and Quilts To Come Home To, by Darlene Zimmerman and Joy Hoffman for EZ Quilting/Wrights, which I edited. Keen insights into the quilting and crafting worlds + savvy marketing instincts = successful strategies for your business! My knowledge base comes from ongoing relationships and affiliations with publishers, teachers and experts, guilds, professional and academic organizations. I attend major, national trade and consumer shows for quilting, scrapbooking, and crafting, and keep up with dozens of magazines in these fields. I take and give classes and workshops, and I always learn from my students. I’ve got a good sense of what creative consumers want, tempered with good taste. I have great respect for art, craft, and the people who pursue them, professionally or as amateurs. (Scroll up to the top and check out my Mission Statement!). It all totals up to a deep understanding and appreciation for the ever-changing attitudes, trends, and changes in many creative communities. Let me introduce you to my husband, Carl Harrington. Carl is an independent marketing consultant with a superb reputation for growing businesses. He was a principal in The Marketing Works! and now serves as president of a non-profit foundation. He’s also my personal marketing guru, constantly helping me hone my own PR skills. That empowers me to offer you an unbeatable combination of understanding your customers, innovative thinking, quality service, and value. Here’s an example: For Quilt-Pro, makers of quilt design software, we worked together on strategic planning. We formulated surveys, conducted focus groups, and helped determine marketing directions and strategies for this company. They’re using our “Yes I Can!” creative copy. I would love to meet with you and discuss the directions you are steering your company. We could look at those areas or opportunities where you wish you could grow but haven’t been able to. Afterwards, we will identify concrete ways to grow your business, and pinpoint some specific areas we all agree would be worth pursuing. I am of course ready to satisfy any concerns you may have about sharing proprietary business information by signing a conﬁdentiality statement that will protect you. I can even provide a draft version if you don’t have one. Whether in strategic planning, pointing out new business opportunities, or the creation of editorial, PR, publicity, sales and promotional materials, our unique combination of knowledge, experience, and skills ensures that you will get a lot of bang for your buck. Topics that stand out-and often stand alone in the marketplace. Quality and value promise a long position on America’s bookshelves.